It's sad that our Thanksgiving weekend is coming to a close. Four days is just a lot of fun to hang out, and by the fourth day, the Scooter family begins to fully, completely relax and have no expectations for the day. Our day consisted of: 1.) going to the park, 2.) going to lunch, 3.) going to Dunn Brothers for a cup of coffee and to read...you can increment one if you include "sleep in". We did accomplish the minor task of picking up paperwork at the rental property...ooo. 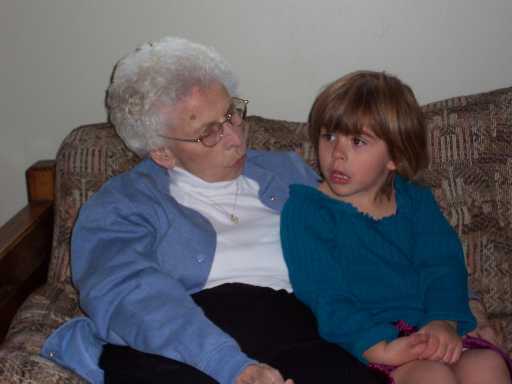 Some pictures from the weekend...Eryn hanging out with great grandma Millie on Thanksgiving day. Thanksgiving "dinner". Do I look hungry? 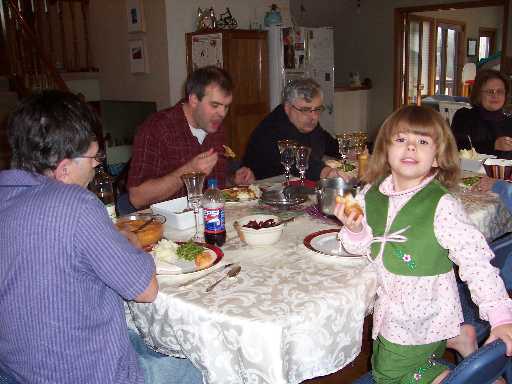 We had at least seven fewer people eating this year...makes a big difference in how full the house feels. That's Lloyd in the foreground...he took all the poker money. Eryn is indeed in a change of clothes...potty training has its successes and its failures. But she's sporting the new outfit Grandma Ellen made for her. I'm not sure if this is before or after Pooteewheet figured out how to put the blouse on correctly. Conner came later. He'd already eaten some turkey, but was feeling the need for a balanced diet. 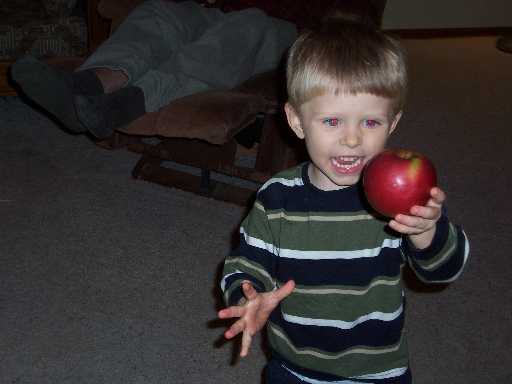 I picture Adam looking like this when Eve gave him the apple in the garden. Non-turkey day video of Eryn just running around in a big circle at the park. We can't afford fancy exercise equipment like my friend Klund, so instead we make Eryn run laps. Thanks for sharing details about your celebration of Thanksgiving. We do not have this in the UK. This is a pity as it seems to retain some of its original meaning - unlike some of the other traditional celebrations. Actually, Conner ate no turkey on Thanksgiving. He at 6 pickles at our first stop and then two apples at your place. Your sister would be proud!